Here is a note that I received from Hubert Spala from UK/Polish company, Rombo Games. This is a game in ongoing development process at the moment, however on our webpage you can see more about how the game is going to look and feel. It is a family board game with mobile app (hybrid game) designed for 2-6 players from 8 years old up. It is simple enough for kids to grasp it but offers enough competitive challenge for adults as well. Publish or Perish is a deduction game where you have to discover the secret properties of the subatomic particles (called hypersymmetry). In order to do so you have to clash particles against each other in the collider and observe the results. After few smart experiments you will be able to deduct the secret properties of some of the particles and trying to build a solid publication paper that will give you a lot of points. Long story short, we capture the essence of the publish or perish motto. As a scientist you need to struggle with the decision of continuing your research and risk that other person will be faster than you or publish your findings to be safe but waste the opportunity of more discoveries. 7/18/2015 – San Francisco, CA – At GenCon 2015, Overworld Games will be releasing two additions to their line of hidden identity and deduction games with New Salem and Good Cop Bad Cop: Bombers and Traitors while demo’ing a third one that will be hitting Kickstarter right afterwards called Booze Barons. Booth: #2836. New Salem ($34.99) is the next great social deduction game about Witches and Puritans attempting to escape the horror of the Salem Witch Trials that plays in under 45 minutes for 3-8 players. Drafting allows you and everyone around the table to play at the same time as you gain clues about who may be a witch. Then you put your “Hope” in the right players so you can put the witches on trial before the end of the game. It gives you a taste of what it may have felt like to be a participant in the Salem Witch Trials where you can expect to say “YOU’RE A WITCH!” more than once during the game. Whether you’re an honest puritan or secretly a witch, you’ll constantly be faced with a decision of whether to help your team or play selfishly. The art by Andrea Olgiati (Winter Tales) will make it a contender for Best Art of 2015. Check out the Press Kit for it or the How to Play Video by one of the designers. The nominee for the Dice Tower’s Best Party Game of 2014, Good Cop Bad Cop, will be getting a new expansion at GenCon called Bombers and Traitors ($14.99). It adds in more equipment, two new roles (the Bomber and the Traitor), and expands it to 3-8 players. It’s the same Good Cop Bad Cop fun where you unravel the mystery of who is on your team and point guns at your friends, but the expansion also adds more opportunities for deduction and deception. Just after GenCon on August 24th, the third game in this line, Booze Barons, will be hitting Kickstarter (preview link). This one takes place during the time of US Prohibition where you’re secretly bootlegging a specific type of booze as you try to make your mob the richest mob in town. There are always 3 teams (mobs) in the game so you’ll have to deduce who is on your team by the deliveries they make to the speakeasies around town. You can be confident in the pedigree of this game as it has been refined during playtesting at Protospiel Milwaukee, Protospiel Austin, Protospiel Houston, Protospiel San Jose, and Unpub 5. Currently available for pre-order only. (Est. ship date, 30 July). Icarus players draw one card each from seven different-colored decks and must bid an amount of one of those colors which they believe is less than the sum of every player’s card in that color. At some point bids, which must increase with each player, will reach so high that they are challenged! With a handy game mat and additional play variations included from the developers at Victory Point Games, we’re sure that Icarus will find a happy landing among your gaming group! Click here for more information on Icarus! The Napoleonic 20 Series features games of only modest complexity, each with a focused scope and low unit density (typically fewer than twenty pieces per side). The dramatic, fast-playing turns feature compelling historical narrative told through random event cards and the exciting ebb and flow of military units maneuvering and engaging in battle on the map. Replete with the surges, lulls, and “friction of war” that gives a great feel for the parry-and-thrust of a Napoleonic grade battle as armies close to bayonet-point to see which will break first! Jack Gill’s Tolentino 20 focuses on battle of 2 and 3 May 1815 which occurred in central Italy during the period of the “Hundred Days” of Napoleon’s brief restoration to the French throne. Murat’s early gains were soon forfeit against the two advancing Austrian corps, but these two corps become separated by the Apennine Mountains. Like Napoleon’s Waterloo campaign, Murat hoped to defeat each corps in turn before they could reunite. One player commands the Neapolitan army under King Joachim Murat; the other player commands the Austrian army under Feldmarschall-Leutnant Freidrich Baron Bianchi. Waterloo 20, 3rd Edition from Joseph Miranda is a game based on the Waterloo campaign of 15-18 June 1815. One player commands the French army, taking the role of the returning Emperor Napoleon. The other player assumes both the roles of Wellington for the Anglo-Dutch forces, and Blücher for the Prussian forces, respectively. Two months after returning to France, Napoleon had an army of 280,000 men and was mobilizing half as many again for the next two months, but he was set upon by Allied coalition armies of nearly 1,000,000 soldiers who were preparing to move against France. The British (110,000 men) and Prussians (120,000 men) were closest, in Belgium, and Napoleon struck first before their numbers could be combined against him. With speed and surprise, he invaded Belgium with fully 125,000 men in a bid to defeat each of these armies in turn before they could unite. Click here for all the details on Hundred Days 20. Boardgames in Blighty Kickstarter News – Casual Game Insider Magazine Kickstarter is Live and you can get a Free PDF Summer 2015 issue! The great guys at Casual Game Insider Magazine have launched their 4th annual Kickstarter campaign and you can also get a free PDF of their Summer 2015 issue as a thank you for checking out Boardgames in Blighty! To get your free PDF issue go here! Enjoy! 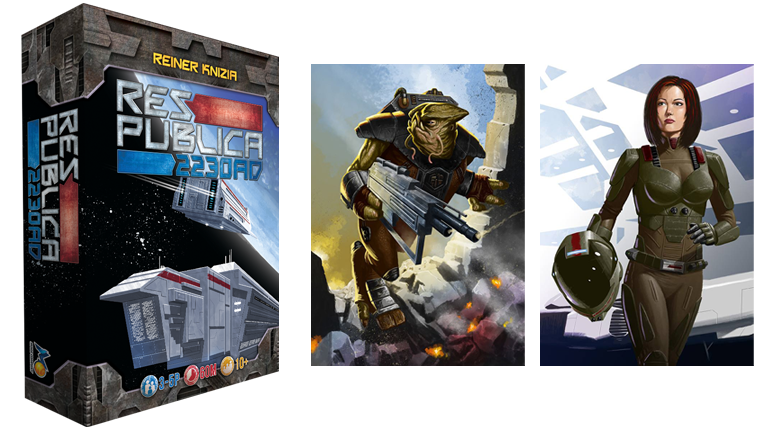 Res Publica returns with a revised version: Res Publica:2230AD and this time ravels in future, where races migrate through Space searching for new areas in which to settle. Intensive trading brings together strong Races, encourages new settlements and promotes the development of civilization. Each turn is divided in three different phases: Trade, Display and Draw cards. Each player at his turn can make a trade offer and each player in turn responds in kind. 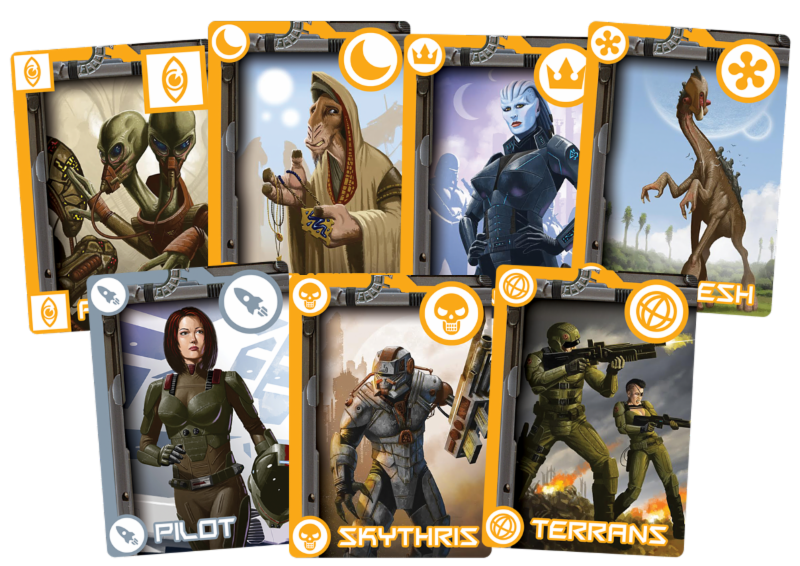 Using the cards through trading and drawing players work to acquire five identical race cards in order to build a Space Station (which increases the number of cards you can draw each turn) or five identical technology cards in order to build a City (which gives Victory Points). Aside the set collection and trading mechanics, you will discover some extra cards in the game. New buildings with different abilities that either allow you to build a City displaying four technology cards, or give you extra Victory Points. At the end of the game, players total the points collected and the highest score wins.